After I had spent half a year doing little more than watching babies grow and writing a review article on the minimal length, I got terribly bored with myself. So I’m apparently one of the world experts on quantum field theories with a minimal length scale. That was not exactly among my childhood aspirations. As a child I had a (mercifully passing) obsession with science fiction. To this day contact to extraterrestrial intelligent beings is to me one of the most exciting prospects of technological progress. I think the plausible explanation why we have so far not made alien contact is that they use a communication method we have no yet discovered, and if there is any way to communicate faster than the speed of light, clearly that’s what they would use. Thus, we should work on building a receiver for the faster-than-light signals! Except, well, that our present theories don’t seem to allow for such signals to begin with. Every day is a winding road, and after many such days I found myself working on quantum gravity. The basic idea isn’t so difficult to explain. The reason that it is generally believed nothing can travel faster than the speed of light is that Einstein’s special relativity sets the speed of light as a limit for all matter that we know. The assumptions for that argument are few, the theory is extremely well in agreement with experiment, and the conclusion is difficult to avoid. Strictly speaking, special relativity does not forbid faster-than-light propagation. However, since in special relativity a signal moving forward in time faster than the speed of light for one observer might appear like a signal moving backwards in time for another observer, this can create causal paradoxa. First, there are wormholes in general relativity, but they generically also lead to causality problems. And how creation, manipulation, and sending signals through them would work is unclear. I’ve never been a fan of wormholes. Second, one can just break Lorentz-invariance and avoid special relativity altogether. In this case one introduces a preferred frame and observer independence is violated. This avoids causal paradoxa because there’s now a distinguished direction “forward” in time. The difficulty here is that special relativity describes our observations extremely well and we have no evidence for Lorentz-invariance violation whatsoever. There is then explaining to do why we have not noticed violations of Lorentz-invariance before. Many people are working on Lorentz invariance violation, and that by itself limits my enthusiasm. Third, there are deformations of special relativity which avoid an explicit breaking of Lorentz-invariance by changing the Lorentz-transformations. In this case, the speed of light becomes energy-dependent so that photons with high energy can, in principle, move arbitrarily fast. Since in this case everybody agrees that a photon moves forward in time, this does not create causal paradoxa, at least not just because of the superluminal propagation. I was quite excited about this possibility for a while, but after some years of back and forth I’ve convinced myself that deformed special relativity creates more problems than it solves. It suffers from various serious difficulties that prevent a recovery of the standard model and general relativity in the suitable limits, notoriously the problem of multi-particle states and non-locality (which we discussed here). So, none of these approaches is very promising and one is really very constrained in the possible options. The symmetry-group of Minkowski-space is the Lorentz-group plus translations. It has one free parameter and that’s the speed of massless particles. It’s a limiting speed. End of story. There really doesn’t seem to be much wiggle room in that. Then it occurred to me that it is not actually difficult to allow several different speeds of lights to be invariant, as long as can never measure them at the same time. And that would be the case if one had particles propagating in a background that is a superposition of Minkowski-spaces with different speeds of light. Because in this case then you would use for each speed of light the Lorentz-transformation that belongs to it. In other words, you blow up the Lorentz-group to a one-parameter family of groups that acts on a set of spaces with different speeds of lights. You have to expect the probability for a particle to travel through an eigenspace that does not belong to the measured speed of light to be small, so that we haven’t yet noticed. To good precision, the background that we live in must be in an eigenstate, but it might have a small admixture of other speeds, faster and slower. Particles then have a small probability to travel faster than the speed of light through one of these spaces. If you measure a state that was in a superposition, you collapse the wavefunction to one eigenstate, or let us better say it decoheres. This decoherence introduces a preferred frame (the frame of the measurement) which is how causal paradoxa are avoided: there is a notion of forward that comes in through the measurement. In contrast to the case in which Lorentz invariance is violated though, this preferred frame does not appear on the level of the Lagrangian - it is not fundamentally present. And in contrast to deformations of special relativity, there is no issue here with locality because two observers never disagree on the paths of two photons with different speeds: Instead of there being two different photons, there’s only one, but it’s in a superposition. Once measured, all observers agree on the outcome. So there’s no Box Problem. That having been said, I found it possible to formulate this idea in the language of quantum field theory. (It wasn’t remotely as straight forward as this summary might make it appear.) In my paper, I then proposed a parameterization of the occupation probability of the different speed of light eigenspaces and the probability of particles to jump from one eigenstate to another upon interaction. So far so good. Next one would have to look at modifications of standard model cross-sections and see if there is any hope that this theoretical possibility is actually realized in nature. We still have a long way to go on the way to build the cell phone to talk to aliens. But at least we know now that it’s not incompatible with special relativity. And why a massless particle would have a speed different than c in these other Minkowski backgrounds? Massless particles always move with the speed that's the invariant of the Lorentz-transformations. But in each background it takes on a different value. Ie, there's a background for c_1, c_2, c_3 and one for c_* which is the speed of light we have measured. In each background, massless particles move with the respective speed of light. But these speeds of light can differ from c_*. Maybe Reimann's mathematical Hypothesis can help set perspective as something which would allow communication holes in between the numbers as sieves? Satellite travel has some potential insights with regard to space travel then why not other forms of perspective within the realm of the cosmos? In the recent article `Conflict between anthropic reasoning and observation'(gr-qc/0303070) Ken D. Olum, using some inflation-based ideas and the anthropic premise that we should be typical among all intelligent observers in the Universe, arrives at the puzzling conclusion that `we should find ourselves in a large civilization (of galactic size) where most observers should be, while in fact we do not'. In this note we discuss the intriguing possibility whether we could be in fact immersed in a large civilization without being aware of it. Our conclusion is that this possibility cannot be ruled out provided two conditions are met, that we call the Subanthropic Principle and the Undetectability Conjecture. Maybe some hints as to the experimental possibilities? "But in each background it takes on a different value. Ie, there's a background for c_1, c_2, c_3 and one for c_*"
I mean why is that? Why that speed takes different values in each bckground? Once I have made a measurement and fixed my version of Minkowski space, how long does it take typically for the state to get a substantial, say 1%, component of other Minkowski spaces? If the particle doesn't do any interaction it just stays where it is. If it does some scattering, it depends on the coupling between the different subspaces. This coupling is basically the parameterization that I have. So the question that I would ask is what fraction of jumping is compatible with the data that we have. However, to answer this one first has to compute the relevant cross-sections for whatever process it is that you're looking at. Which I haven't done. Third, deformations of special relativity which avoid an explicit breaking of Lorentz-invariance by changing the Lorentz-transformations. (...)"
I don't like wormholes, but I read long ago that some russian group of astrophysicists were searching evidence from wormholes in space and stars. About Lorentz-violation, the framework of SME and the current bounds on their violation parameters are so tiny that if we found them (signals of Lorentz violations) we would face more "hierarchy-like" problems...I don't know if it could be good/bad for the field (quantum gravity). But such measurements have been done and shall be done (Measure all that can be measure). About deformations of relativity, I think it is the most plausible scenario provided we can consistently predict something new. Indeed, it is little known the work about the kinematical relativity groups (levy-blond et al) and the possible deformations (there are some powerful theorems like the one by Vilela-Mendes on Lie stabilization kinematics). However, I am surprised there is no many people trying to guess alternative models to lambda-CDM, since it seems to me we are going to be faced with more troubles when Planck releases data. Low has some pretty work about the quaplectic group, and I have even read a nice australian thesis about reciprocal relativity. Moreover, the discovery of the Higgs field as the right model( if it is checked in the next months/weeks), fits into the idea of what vacuum is made of, but also, what is the space-time role when we were able to do some truly quantum theory for the metric field/operator! "prevent a recovery of the standard model and general relativity in the suitable limits" ECKS gravitation. GR is a subset. The SM is defective, SUSY is wrong. "There really doesn't seem to be much wiggle room in that." Wiggle room: Quantum field theories (QFT) with Hermitian Hamiltonians are invariant under the Poincaré group containing spatial reflections. Parity is a spatial reflection but parity is not a QFT symmetry! Hermitian Hamiltonians contain a symmetry and an observable with parity properties, but the Hamiltonian will not be symmetric under spatial reflection. QFT with non-Hermitian Hamiltonians have real and positive energy spectra with PT invariance, but do not contain parity invariance alone. The iBEM will compete with the iLGM, avoiding Beltway allegations of trade monopoly. The idea of superluminal communication through entanglement is not new and it's studied extensively in both experimental, both theoretical ways. Of course, it's thorough general formulation in the rigorous language of quantum field theory may be quite demanding. IMO the caveat of this approach is in the assumption of collapse of quantum function of entangled pairs, which would still require the existence of some superluminal/extradimensional process on background to work. Anyway, it's impressive, that some people are capable of so deep and complex studies while they're successfully raising two small kids. I think the #2 is the most likely if you think about the pheromone case. 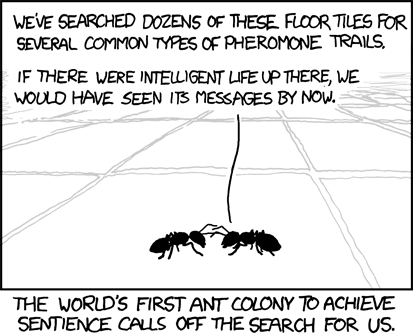 You wrote " There is then explaining to do why we have not noticed violations of Lorentz-invariance before", and ant could say " There is then explaining to do why we have not noticed violations of pheromone communication before." I remember that Bryce de Witt mentioned fuzzy lightcones in his Sci. Am. Dec, 1983 article. I think this is somewhat similar to your toy model of quantum gravity. I think you are wrong to give up on wormholes. The problem in the conventional theory of wormholes is that they are presumed to be static and non- dissolving. This idea leads to immense energy requirements to create one. It's a non- starter on macroscopic scales. Don't pay attention to the cultural references to wormholes and all the hoaky things that go with it. Of course it would turn any bright person off of them. The important thing about the concept of wormholes is how it integrates ideas about inertia and the energy in the quantum vacuum. You could actually think of gluons in nucleons as representing a quantum wormhole. Quarks are physically linked together in a way very much akin to two objects on either side of the throat of a wormhole. Immense energy is contained in those gluons and they comprise 50 times the bare mass of the quarks. We don't normally think of the link between quarks as representing a superluminal bond just because the distances are so small. That seems like a mistake to me based on our common prejudices about all things tiny. But how could you possibly have asymptotic safety in which the bond gets STRONGER with distance without a superluminal component to that concept? There is very much a wormhole core in the structure of nucleons. Since c is a dimensionful quantity, a measurement of it in one background cannot reliably be distinguished from another background unless the backgrounds somehow also come with fixed mutually-compatible reference units. Or am I wrong about that? I see the notion of speed of light as a problem of this approach General Coordinate invariance allows to scale time coordinate and spatial l coordinates of M^4 and this changes the numerical value of parameter that we identify as speed of light. Variation of c would mean varying the choice for the units of time and length only. Speed of light depends on space-time coordinates for more general choices of coordinates (time and length units depending on position). In other words, speed of light is not a general coordinate invariant quantity unless one defines it in special coordinates whereas the notion of light-like geodesic is. It does not make sense to speak about superpositions of Minkowski spaces with different of speed of light. One can however consider an alternative approach allowing description of gravitation using induced metric. Space-time would a 4-surfface of some space M^4xS. The induced metric would define the notion of light-like geodesics. If S has Euclidian signature of metric the time taken to move from point A to B along space-time surface would be an operationally well defined quantity, and in general longer than this time when A and B are connected by light-like geodesic of M^4. Thus maximal signal velocity along space-time surface would depend on the 4- surface and would be smaller or equal to that in M^4. One can speak about quantum superpositions of 3-D surfaces. If one assumes holography in the sense that space-time surfaces are fixed by their 3-D sections, one can also speak about quantum super-positions of space-time surfaces and speed of light is different for the surfaces in the superposition. sorry. I proved three times that I am not a robot. May congratulations for the proof - extremely difficult with my eyesight- would prevent multiple proofs. "A possibility to solve the problems with quantizing gravity" arxiv 1208.5874. I would like very much to see a blog post about this and read the discussion of it by your regular commenters. To me (from the sidelines) it seems an extraordinarily fertile idea. I've posted about the paper at PF--but so far no response. Getting back to my comments about gluons being quantum wormholes... They seem to work just like a Chinese finger trap. As long as there is no pulling tension between your two fingers your fingers are free to act independently of each other while still being enclosed by the trap. This is the asymptotic freedom phase. Once there is tension or, in the case of quarks, increased angular momentum, there is no longer independent action on either end of the trap. The asymptotic safety phase. It might sound a little stupid (just because it seems so simple) but it might be worthwhile building a mathematical model of the dynamics of finger traps. This would have to include the absorption of photons or emission of photons in the change between asymptotic freedom and safety. My intuition, which is usually pretty good, tells me that moving to the safety phase from the freedom phase would involve absorption of photons. BTW, if this simple finger trap model starts emerging as a law on macroscopic scales it would have deep philosophical implications for the best way to be in the world. It would say that most of the non violent core principles in some religions are in agreement with physics. The more you resist, the more you are bound to what you resist. The more you accept different points of view the more freedom you will actually have. Nice. How do science blogs change the face of science? Why does the baby cry? Fact sheet.